The story of Shepherd Neame began in 1698 [but see below for possible earlier origins] when Captain Richard Marsh of the Cinque Ports Militia, a mayor of Faversham, founded a brewery over an artesian well in the town's Court Street, then known as North Street. At that time, Faversham was a bustling port, and already enjoyed a brewing tradition dating back to the 12th century when King Stephen founded a Benedictine abbey just yards from the present brewery site. It didn't take the Cluniac monks long to discover that Faversham's pure spring water could be combined with locally-grown malting barley to produce a particularly fine ale. Early 18th century records reveal that Richard Marsh was a brewer of some size and certainly larger than the 23 other brewers in the town. Marsh died around 1727, but the brewery remained in his family's hands until 1741, when ownership passed to Samuel Shepherd, a maltster and member of a prominent landowning family. With a growing population to serve, Faversham was becoming an increasingly important brewing town when Shepherd was joined in the business by his sons Julius and John. It was at this stage that the family began buying pubs, several of which are still owned by the company today. In 1789, Julius Shepherd bought a steam engine from Boulton & Watt, the first to be installed in any brewery outside London. It revolutionised the production - grinding malt and pumping water, wort and beer around the brewery - work previously done by horses. Julius Shepherd was joined in partnership by his sons and grandsons until 1819 when the business was left solely to his great-grandson Henry. As various partners joined the firm, so the name changed to Shepherd & Hilton, Shepherd & Mares and, finally, when John Mares died and 28-year-old Percy Beale Neame joined the partnership in 1864, Shepherd Neame & Co.
By 1877, Percy Beale Neame was in sole control, and over the next 10 years he was joined by his eldest son Harry and his brothers Arthur and Alick. Young Harry had trained as a brewer, Arthur established a bottling department, and Alick concentrated on the wines and spirits side of the business. It was in the late 19th century that the Court Street offices were extended into the offices fronted by the hop-fringed door that stands today. And the acquisition of pubs accelerated, so that by the time of Percy Neame's death in 1913, the brewery owned 85 tied houses. The following year, Shepherd Neame became a private limited company and all of Percy's 10 children became shareholders. When Percy died he had laid the foundations of today's successful brewing concern. Harry continued to run the business on his own until 1925, when he was joined by his son Jasper and later by his younger son Laurie. Jasper Neame became chairman in 1941 with Laurie as his deputy, who took over as managing director in 1961 when his brother died. 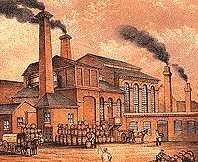 Under the leadership of Jasper and Laurie Neame, the company acquired Mason's Brewery in Maidstone, together with their 50 pubs, because the brothers had realised the need to acquire more outlets for its beers. At the end of the 1940s, the company's freehold properties were valued at £460,000, which rose to £1 million following the Mason's purchase. The 1970s and 1980s saw another 112 pubs added to the estate, and at the outset of the 1990s, the company owned 264 pubs. Today, it owns more than 360 pubs. The company's current president, Jasper's son Robert, joined the brewery in 1956. More recently in 1991, his son Jonathan arrived and is now chief executive - the fifth generation of the Neame family at the helm. As Shepherd Neame embarks on the 21st century, no brewer is doing more to ensure that Kent's unparalleled brewing heritage survives and flourishes for generations to come. Shepherd Neame has traditionally taken its foundation date as 1698, but new research has uncovered evidence of brewing on its site for at least a century before that. Details of the research were revealed at the opening, on 24 July, 2006, of the brewery's visitor centre after a £350,000 refurbishment. John Owen, a Faversham historian acting as honorary archivist for Sheps, has traced how one John Castlock (or Caslock) the younger bequeathed a brewhouse on the site to his wife and then his son-in-law, Thomas Hilton, in 1612. Caslock's father, John Caslock the elder, occupied the old Faversham Abbey brewhouse in the abbey grounds before 1550 and is known to have exported both grain and beer. Brewing was transferred to Court Street from the old abbey brewhouse between 1550 and 1573. John Caslock and his father appear in the Court Street list in Faversham muster rolls between 1573 and 1595, the new research shows. Many of the relevant historical documents are on show for the first time at Sheps' visitor centre, which has been transformed into a modern visitor experience and the main focus of brewery tours. Dr Arthur Percival, director of the Faversham Society's Fleur de Lis Heritage Centre, has long suggested that Shepherd Neame's origins might go back farther than 1698, noting that the late Professor Theo Barker's 1998 history of the brewery states that its first identifiable owner, Richard Marsh, had been paying the town's largest brewing licence fee in 1678. Dr Percival said: On 20 April, 1653, a rental was drawn up for the Manor of Faversham (Centre for Kentish Studies U390/M43/2). Though premises were not numbered in those days, the entries are in sequence, and in a location in Court Street which probably corresponds to Marsh's brewery is recorded a tenement and brewhouse in the occupation of William Dix. The owner was Thomas Hilton, who, the rental says, had inherited it from John Caslock the younger, son and heir of John Caslock the elder, who is recorded as paying a cess (rate) on premises which were probably identical on 31 December 1573 (CKS Fa/AC/1, fol 153v). This John was described as a beerbrewer' in 1550, when he administered the estate of his father William, who had died intestate. William, the brother of another John Caslock, who was the last Abbot of Faversham, came from the Isle of Sheppey. In Faversham he was already well established by 1525-1527, when he was exporting beer through the town's Creek (Patricia Hyde, Thomas Arden in Faversham, Faversham Society, 1996, p 396).